Wallace Middle School Presents Disney and Cameron Mackintosh’s Mary Poppins Jr.
P.E. 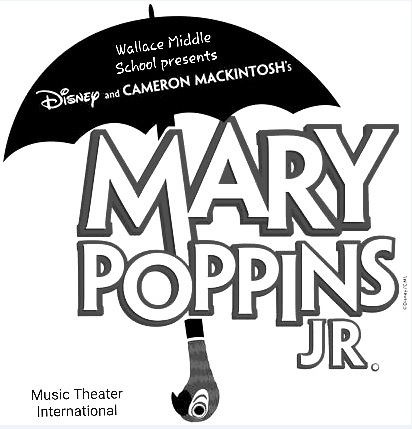 Wallace Middle School will present Disney and Cameron Mackintosh’s Mary Poppins Jr. on Friday (Jan 25) at 7:00 p.m. and on Saturday (Jan 26) at 1:00 p.m. in the P.E. Wallace gym. Admission is free, but the students are accepting canned good/non-perishable pantry items that will be donated to Titus County Cares. The jack-of-all-trades, Bert, introduces us to England in 1910 and the troubled Banks family. Young Jane and Michael have sent many a nanny packing before Mary Poppins arrives on their doorstep. The production features Kate Ball as Mary Poppins, Jeffrey Bond as Bert, Christian Johnson as George Banks, Ayden Osterdock as Michael Banks, Danika Beckham as Jane Banks, Alivia Newman as Mrs. Brill. Also, Evelyn Hernandez as Miss Andrew, Isaac Villarruel as Von Hussler, Julian Chancellor as John Northbrook, Melanie Logue as Neleus & Miss Smythe, Patty Gonzales as Bird Woman, Rolston Morton as Robertson Ay, Claire Muskrat as Mrs. Corry, Sedera Lampard as Winifred Banks, and Dawson Hernandez as a policeman. The Wallace 6th-grade choir classes, 6th-grade theatre classes, and the 5th-grade Honor Choir serve as members of the chorus. The musical is under the direction of Diane Swiger, Wallace 6th-grade choir & theatre teacher with the invaluable creative input & assistance from Josh Miles, Wallace/MPJH music teacher; Crystal Peel, MPJH theatre teacher; Jace Sturgill, MPHS theatre teacher; Nancy Vines, MPHS choir director; Jared Erickstad, MPJH teacher, and Wallace parent, Sarah Bond.